U.S. House District 3 Voter Guide Now Available at NC Family.org! As a service to North Carolina voters, the NC Family Policy Council has surveyed all candidates running in the Special Election to replace former Congressman Walter B. Jones, Jr. in the state’s 3rd Congressional District. The candidates’ responses are now available on NC Family’s U.S. House District 3 Voter Guide Page. 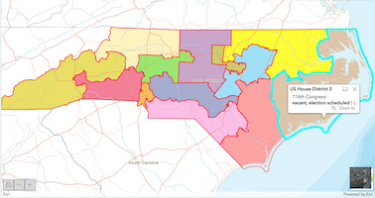 This Eastern North Carolina district seat became vacant after Congressman Jones passed away in February, and a full slate of 26 candidates filed to run to replace him. NC Family’s Candidate Questionnaire surveyed the candidates on questions relating to abortion and life issues, religious liberty, gambling, marijuana legalization, and tax policy. The candidates’ responses are now available on the U.S. House District 3 Voter Guide Page, where you can also view a scanned version of their completed questionnaires and read any additional comments or explanations they provided. NC Family reached out to each candidate multiple times by mail, phone and email (when available) to encourage their participation in the 2019 Voter Guide, and we received responses from 16 of the 26 candidates in this race. U.S. House District 3 Election Schedule: Early voting in this district began Wednesday, April 10 and runs through April 26. The Primary Election is scheduled for Tuesday, April 30. The General Election will be held on Tuesday, July 9, unless the leading candidate in any of the primary races fails to obtain more than 30 percent of the vote. If this happens, a runoff second primary may be held on Tuesday, July 9, and then the General Election will take place on Tuesday, September 10. Which Congressional District Am I In? If you are unsure whether or not you can vote in the 3rd Congressional District, check your voter registration card or visit the Voter Search Page on the State Board of Elections website to determine in which congressional district you are registered to vote.